The world’s longest sandstone cave just got discovered at (wait-for-it) Meghalaya. So drop your Goa plans and head out to the Northeast this summer! The world’s longest sandstone cave, Krem Puri has recently been discovered in Meghalaya. And it is a staggering three times bigger than Mount Everest? Yes, our jaw is still on the floor. Here’s more: this 24.5km sandstone cave is also home to dinosaur fossils, especially the Mosasaurus, a giant reptile that lived 66-76 million years ago. It has hardly been a month that the record-breaking sandstone cave was explored, so visit before all the tourists start flocking to the place. And besides, Krem Puri is not the only cave you will get to see. 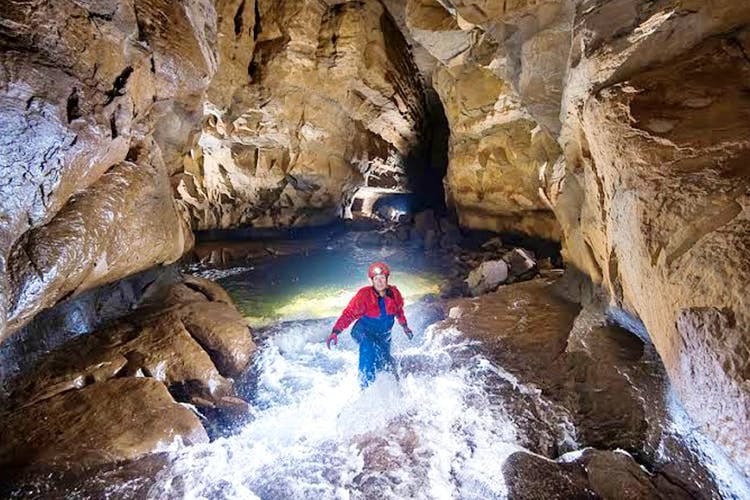 Scientists and explorers have unearthed a ton of new caves in Mawsynram. Plus, add all the stunning waterfalls and limestone caves to your list. And if you’re into adventure sports, tick off your bucket list in Meghalaya – trekking, river rafting, cave diving, and more. From April to June, Mawsymram and adjoining places remain more or less clear, and the chill in the air optimally pleasant. Try not to delay it till Pujo, because that’s when it starts getting damp and cold. Krem Puri is near the village of Laitsohum in the Mawsynram area of East Khasi Hills district, 70km from Shillong. The nearest airport is in Shillong from where it’s just about an hour’s drive, but if you want to get a taste of Meghalaya’s insane scenic beauty, take the 4-hour drive from Guwahati. You can opt for home stays in Mawsynram or put your bags down at Shillong or Cherrapunjee. You can try out this mountain-chic Pinteresty resort in Cherrapunjee called Polo Orchid Resort. They even have log cabins, situated on top of the hill with an insane view of the villas below. And guess what, these log cabins even come with their own private plunge pools overlooking the valley! Don’t leave home without rainy day essentials! You’re going to literally the rainiest place on earth, so pack all your umbrellas, raincoats, gumboots and the like.